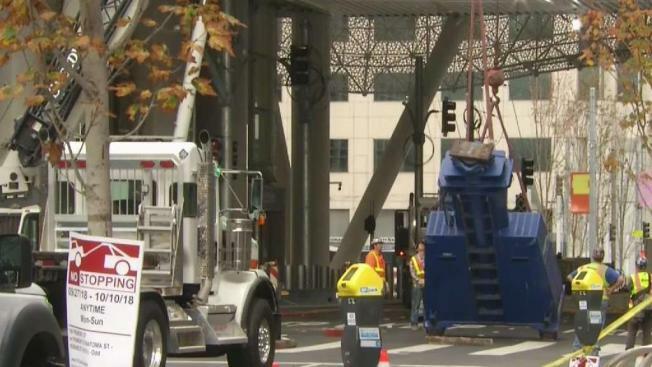 Testing will soon begin on those giant cracked steel beams discovered in San Francisco's brand new Transbay Terminal. The NBC Bay Area Investigative Unit has been reviewing thousands of construction records to get to the bottom of what went wrong. Investigative Reporter Jaxon Van Derbeken reports. Back in 2015, contractors and engineers disagreed about the need for the weld access holes now suspected of causing giant cracks in critical support beams, Transbay documents reviewed by NBC Bay Area show. NBC Bay Area’s Investigative Unit first reported on those weld access holes as possibly being responsible for cracks in two critical support beams across Fremont Street. Cracks that forced the new Transit Center to shut down just weeks after it opened. This week, San Francisco Supervisor Aaron Peskin asked Transbay construction manager Dennis Turchon whether the access holes may be to blame. The testing is being done in New York and is expected to be done in mid-November. Meanwhile, documents obtained under the Public Records Act show extensive debate about the need for those access holes at a time when the project was running behind schedule. “It is not clear what is meant” by an engineers’ comment about the access holes, the lead contractor on the project noted in late 2014. The contractor wanted the specific location and dimensions for the holes, “if required” for the project. The notches are called weld access holes because they are supposed to keep workers from welding themselves into a corner at critical locations. Project managers replied in January 2015 that the holes were indeed required, stressing that they should be fashioned to comport with recognized welding standards. But one document shows that did not happen. In March 2015, a firm enlisted to help oversee the project, Skanska, noted that Herrick Corp. had nearly completed the welding work without creating the required access holes. Herrick “is asking if the hole is required,’’ according to an entry in Skanska’s quality control log at the time. “Skanska QC (quality control) will further investigate this issue.” The following month, a log entry made it clear that the holes were ordered after the fact to eliminate an apparent problem where two welds came together. “Skanska has directed” Herrick to put in the holes, the log entry from April notes, “to mitigate any question” about the questioned location where two welds butted up against each other. Williams wondered about the need for holes at all – given that the welding work had already been done without them. The holes that ended up being cut with a torch were risky, he said, not only because sharp corners left behind could encourage cracking. They also may have damaged existing welds and further promoted cracks. “It seems like there was no one on top of the problem,” Williams concludes. Transbay officials have declined to answer questions about the weld access holes, referring only to the documents they have provided. Meanwhile, San Francisco officials have put on hold $10 million earmarked for design of the second phase of the project, until they get to the bottom of what went wrong with construction, during the first phase.